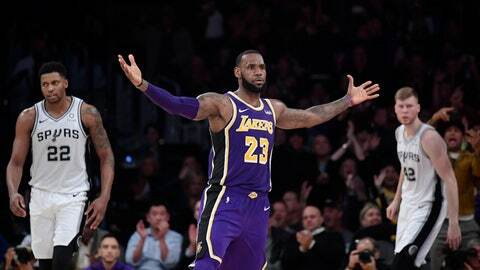 LeBron James’ first season with the Los Angeles Lakers has generated plenty of hoopla but not as much scrutiny as his signing with Miami in 2010 and move back to Cleveland in 2014. That’s why it might be the perfect time for a series looking at the relationship between James and three of his closest friends and business partners. ESPN is airing “More Than an Athlete,” an eight-part series looking at James’ journey from high school basketball prodigy to one of the world’s best-known athletes through the eyes of James and his friends Maverick Carter, Randy Mims and Rich Paul. The series, which has released four episodes and has four more debuting on Tuesdays through Jan. 8, is produced by UNINTERRUPTED, the award-winning digital media company founded by James and Carter. “Now is a good time to show where we are in our lives,” Carter said in a phone interview. The episodes feature the four looking at old photos and videos but also having free-flowing conversations about a 20-year relationship between the four friends as well as looking back at successes and failures. The group’s best-known misstep — The Decision — gets an entire episode. Most of the discussions are with the group but there are also individual interviews with all four. Most of the later episodes will focus on James’ first season with the Lakers on and off the court. “The whole thing is free-flowing as it relates to the relationship ebbing and flowing. We’ve been working on pulling all of the pieces together since June and July, but it is still going on,” Carter said. Connor Schell, ESPN’s executive vice president of content, said the series fits in well with ESPN ‘s original programming during its first year. The streaming channel has already debuted two “30 for 30” films and featured an all-access look at Duke basketball’s offseason. Schell said conversations with James and Carter began earlier this year before the channel’s launch. Major League Baseball and Fox agreeing to extend their deal though 2028 was not a surprise. What many forget, though, is that both needed each other in 1996 when MLB was coming off The Baseball Network failure and Fox was looking to build up a sports portfolio that already included the NFL and NHL. The CBS package of Southeastern Conference football games saw a 13 percent increase over last year. Alabama made six appearances on the network this season, which was an increase of two over last year. A big reason for the increase was that the Nov. 4 Alabama-LSU game and the SEC Championship game against Georgia got huge numbers. Last Saturday’s game was the second-highest watched SEC title contest. Thanksgiving features on NFL pregame shows are normally known for telling tragic stories, which Charlie Bloom knows all too well. But the CBS producer found something different in doing a profile on former NFL player Aaron Maybin . “Walking the Walk” showed Maybin’s work as an art and literacy teacher three days a week in Baltimore. “Usually there is conflict and resolution as well as some true tragedy in the past. In this one, the tragedy, conflict and resolution was in other people’s minds as far as how they judged Aaron’s career. In his mind he had another plan,” said Bloom, who has done 17 Thanksgiving Day features for The NFL Today. “His life as a teacher and artist is something he is comfortable with.